“Aakash Ganga” (or “River from the Sky” in Hindi) is a rainwater harvesting system, specifically developed by Sustainable Innovations to assist villages in rural India that have insufficient access to clean water. Aakash Ganga is designed to be a holistically sustainable Public-Community-Private Partnership (PPCP), one that is sustainable economically, culturally, operationally, institutionally, socially, technologically, and ecologically. Every homeowner in the community with a roof is asked to lease the rights to harvest their rooftop rainwater. Roof rent is paid as one-time subsidy to build a rainwater reservoir at the home owner’s quadrangle. In exchange, the home owner contributes part of the rainwater to the shared reservoir for the community’s use. The rooftop rental scheme is analogous to a utility company acquiring “right of way”. Homes are provided with the gutters, spouts and pipes that are connected to a network of interconnected underground storage reservoirs. The reservoirs are of two types.A home reservoir of typically 25,000 liter capacity is connected to each house for the sole use of the home owner’s needs. Village reservoirs are about 400,000 to 1 million liters . Some of the water is channeled to a larger village reservoir to provide drinking water to those who live in houses with thatched rooftops that cannot be used for harvesting. In addition, a portion of the water in the village reservoir is used to generate enough revenue to cover operational costs and then to pay a return to social investors. Communities also contribute 10,000 M2 land. Part of the rainwater in the community reservoir is used for horticulture, generating sufficient revenue to pay for AG’s upkeep and return to social investors. AG maximizes revenue per liter of irrigation water and per unit of land. Villages are steeped in cultural traditions and social norms. Often, the traditions are viewed as anchors that tie a society to its past, sap its agility, and impede progress. AG realized the economic value of the traditions through innovations: Villages lack sanitation system. Open defecation is common. Contamination of water bodies is a reality. Rather than turning to technology, AG used the local tradition of “Jalawa Puja ” to guard water bodies from contamination. Now, the mothers champion protection of the reservoirs. Communities have strong familial bonds. AG monetizes familial bonds by engraving his mason’s family name on the reservoirs. The recognition lets the grandson exult: “My grandfather built it. I need to take care of the reservoir.” The masons are expected to discount their wages. Communities respect age. The foundation laying ceremony is led by the eldest and the youngest citizens. This act sends a sublime message: Water bodies are a heritage — being passed from one generation to next. An emotional investment by the communities! AG’s engineering automation tool enables a junior engineer to design the system in a few days and to minimize costs. The tool uses satellite images, Global Positioning System, Geographical Information System, and Genetic Algorithm. 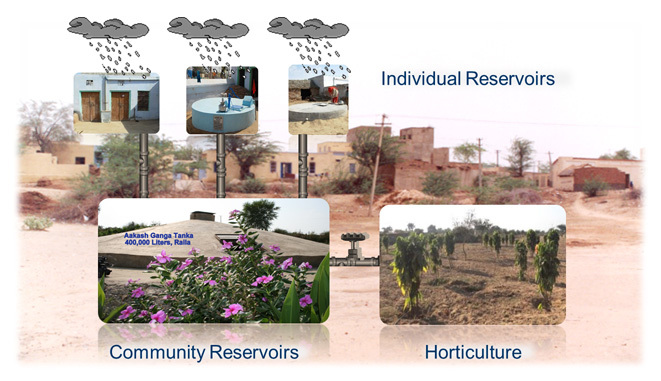 AG’s conceptualized IT network to monitor water quality and utilization of million reservoirs. People can track service requests online. Absence of street names and house numbers posed huge challenge to identify physical location of every reservoir. AG’s numbering plan, based on the relative position of the reservoir to a key village landmark, assigns a unique identifier to every reservoir. An IT network monitors water quality, utilization, treatment, and repairs. Using a package- delivery type of tracking process, water samples and repair requests representing several million reservoirs can be managed from a single dashboard. Aakash Ganga’s “social audit” approach affords the villagers the same access privileges to project records as enjoyed by the corporate auditors. Such transparency wins the trust of the people. The example of the project becomes a potent tool that can empower the villagers to challenge and eliminate corruption around them. Devised online Social Audit to afford people privileges at par with the U. S. corporate auditors. Social Audit may become de facto standard for transparency and accountability. SI is building a knowledge repository of best practices, including bill of materials, cost and schedule estimates and blueprints that can be shared with anyone interested in replicating the model. SI has selected several partners for design and implementation and to help build local capacity for a future larger scale roll-out. Birla Institute of Technology and Science (BITS), the premiere engineering institute of Rajasthan, is SI’s lead technology partner; Humana People to People India (HPPI) and Bhoruka Charitable Trust (BCT), and Samgra Vikas Sansthan are field implementation partners, the later with at least 10 years’ experience with community mobilization and implementation of rainwater harvesting systems; Other partners included the Society for Community Organization and People’s Education and the Indian Institute of Health Management and Research. To be able to have a significant impact in India, the project must be able to fund expansion through multiple sources. In addition to its own donation and grant fund-raising activities in the US, SI raises money for the project through a combination of for-profit social benefit and non-profit organizations in India. Having a for-profit organization in India enables social investors to make an equity investment in the project. The existence of an Indian non-profit organization makes Indian government funding more accessible. Village governments are also able to make in-kind contributions of land to the project that have to date averaged 10,000 M2 per village to the project. The village government contributes 10,000 M2 land to be used for revenue generation and to increase catchment surface. Aakash Ganga maximizes revenue per unit of irrigation water and unit of land. Villages lack sanitation system. Open defecation is common. Contamination of water bodies is a reality. Rather than turning to technology, AG used the local tradition of “Jalawa Puja” to guard water bodies from contamination. Now, the mothers champion protection of the reservoirs. When a child is born, the mother performs water worship at the local well. Absence of street names and house numbers posed huge challenge to identify physical location of every reservoir, uniquely. AG’s numbering plan, based on the longitude and latitude coordinates, assigns a unique identifier to every reservoir. In summary, PPCP needs to be systemically sustainable to impact millions. And systemic sustainability requires social, engineering, institutional, enterprise, ecological, political, and a host of other innovations.